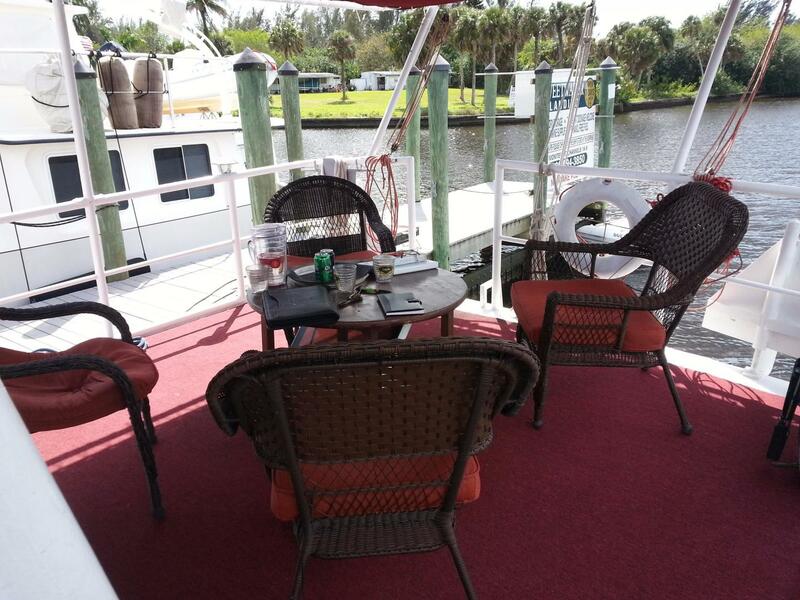 Price just reduced - seller is motivated! 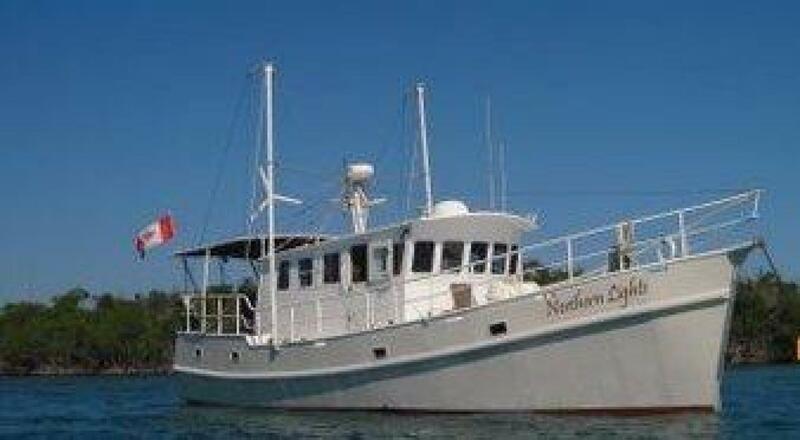 Northern Lights delivers on the dream.This yacht started as Gorge Buehler Diesel Duck designed and was enhanced by this one time owner. 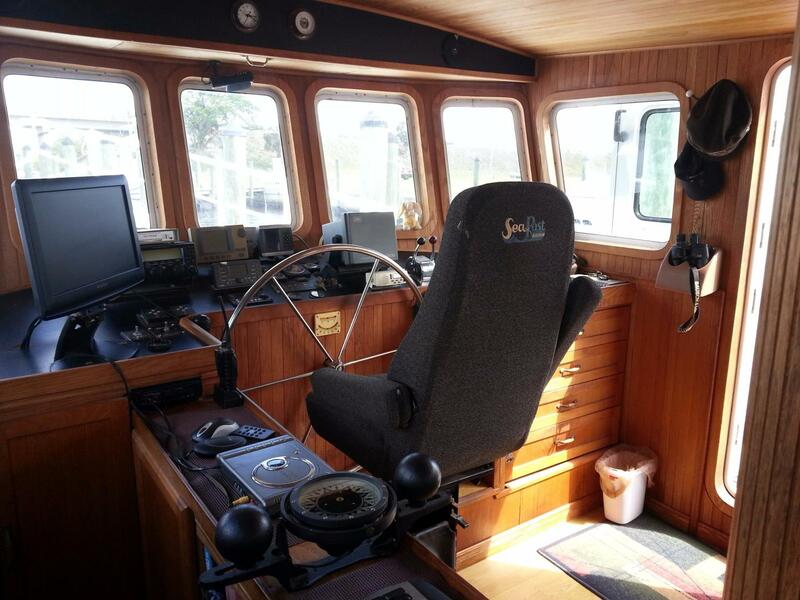 The enhancements takes an outstanding designed and makes it an exceptional blue water trawler that will circumnavigate the world in a safe and secure environment while providing a stable, comfortable journey across the seas. 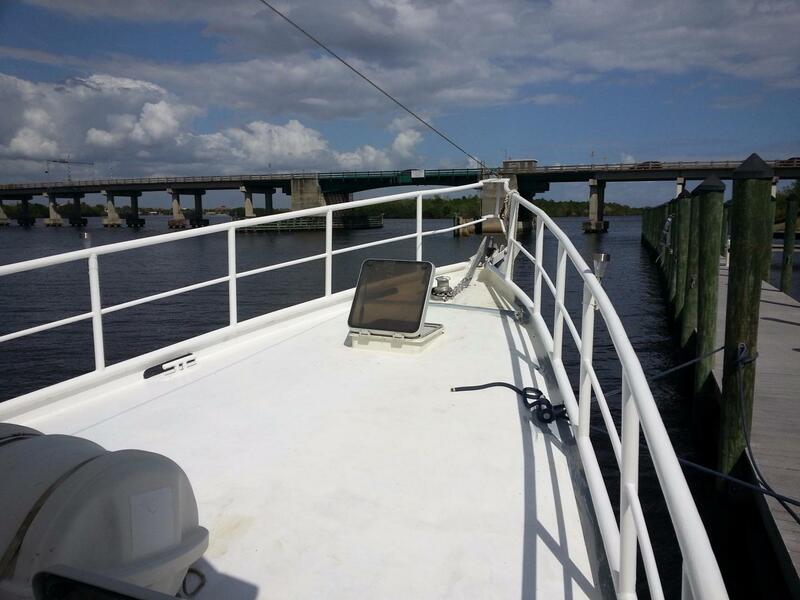 The engine efficiency , drive train, prop and fuel capacity delivers a 5,000 mile range per Fueling; allowing a trip across the Atlantic and back. 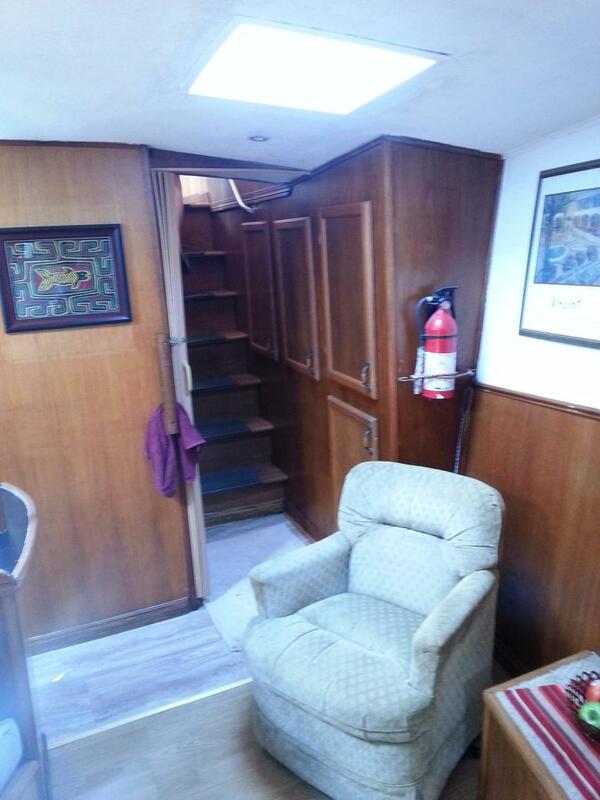 The covered quarter deck, extended pilot house, aft stateroom and forward salon with a full galley makes living aboard this vessel a real joy. 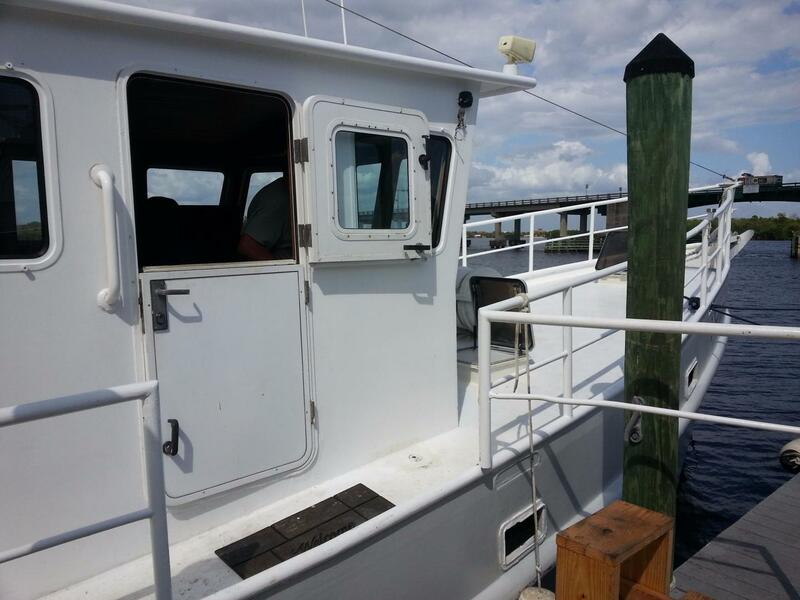 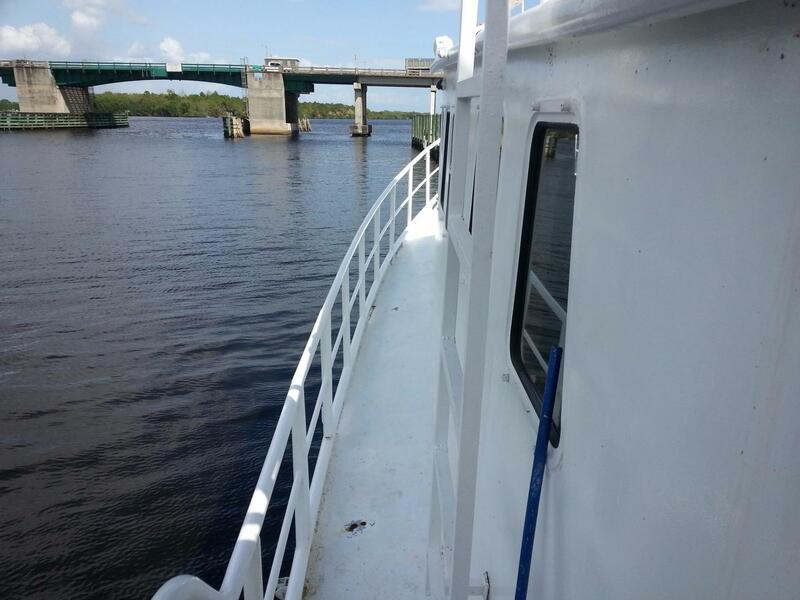 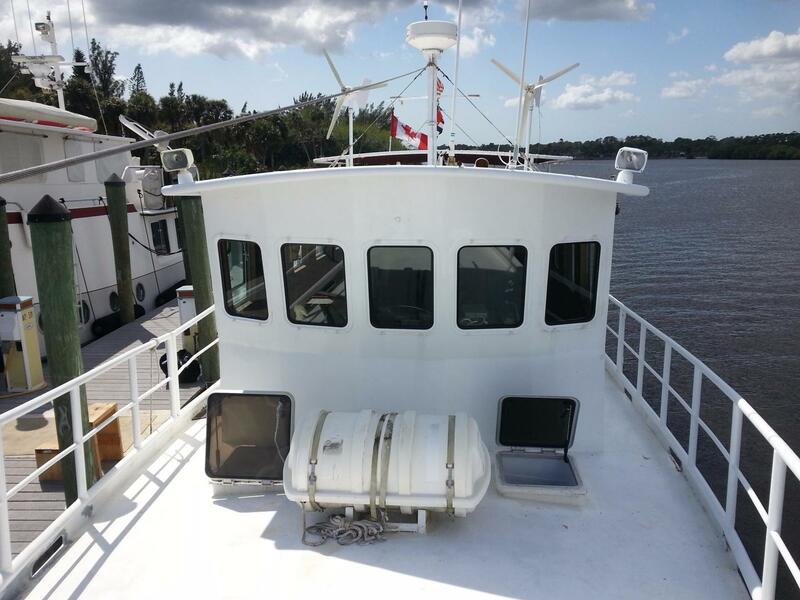 This Enhance Diesel Duck was appraised by an Independent Professional Marine surveyor with a replacement value of $650,000. 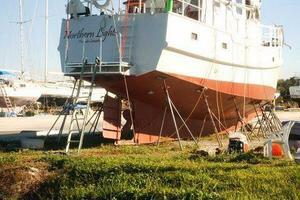 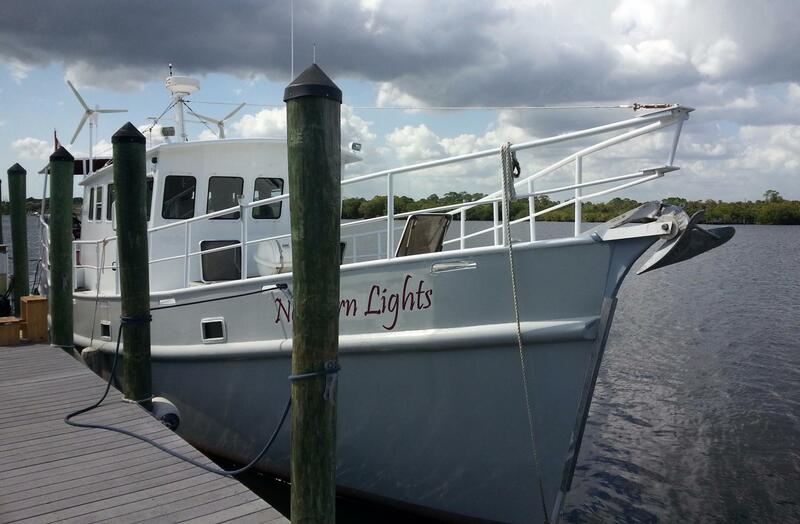 “ I had Northern Lights professional built in a quality shipyard to start my dream to cruise around the world. 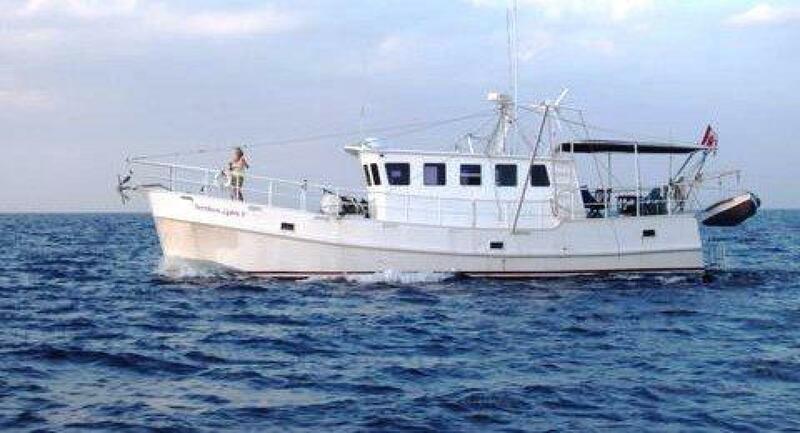 Since I was betting my life on her I had her built strong and she has served me well in some serious ocean waves to Central America, the Panama Canal. 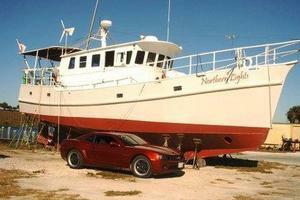 She has a cruising range of 6000 Miles. 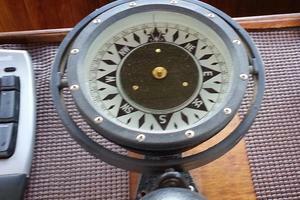 I did get as far as South America but then chickened out based on my age (70...I should have left for the world cruise at 60 or so !). 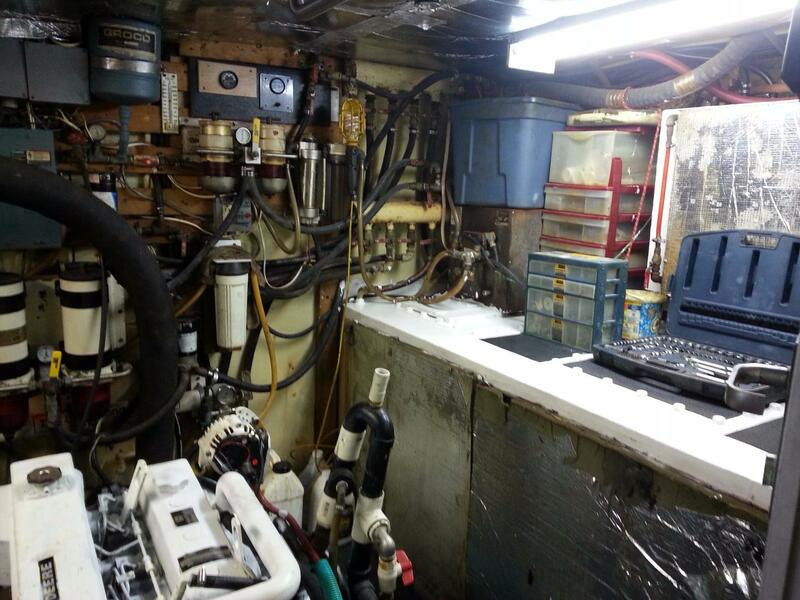 Included with purchase is a full illustrated operations manual detailing all the boat operations (for example Fueling, Oil Changes, Battery care, Auto pilot, Anchoring etc) as well as a full library of all the component manufactures installation and maintenance manuals (Water maker care ,Hydraulic steering etc). 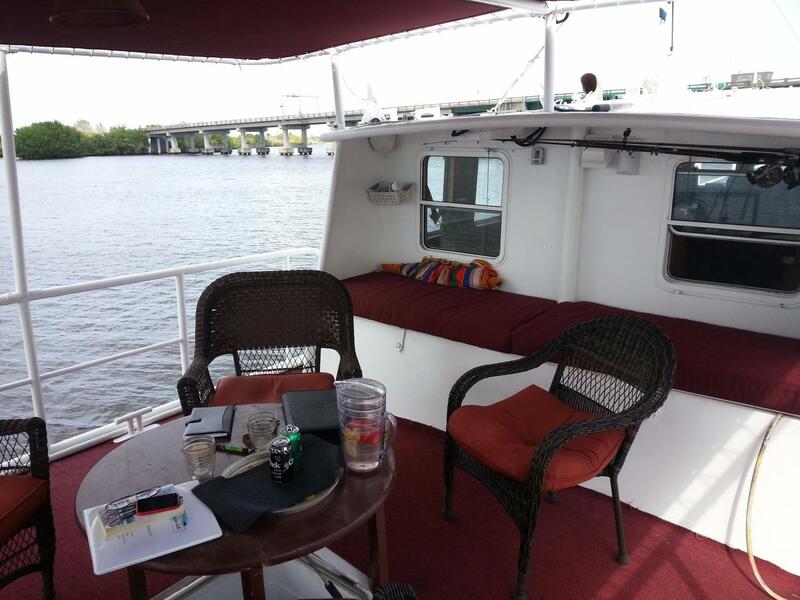 Also available post purchase ( separate from any pre purchase sea trials) is a 3 to 5 day shake down cruise to the Bahamas to train the new owner on all the operation of all systems including the galley, sleeping and of course post day sunsets and drinks on deck!). 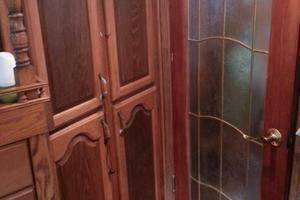 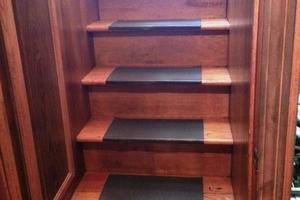 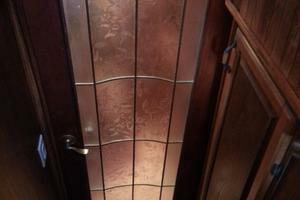 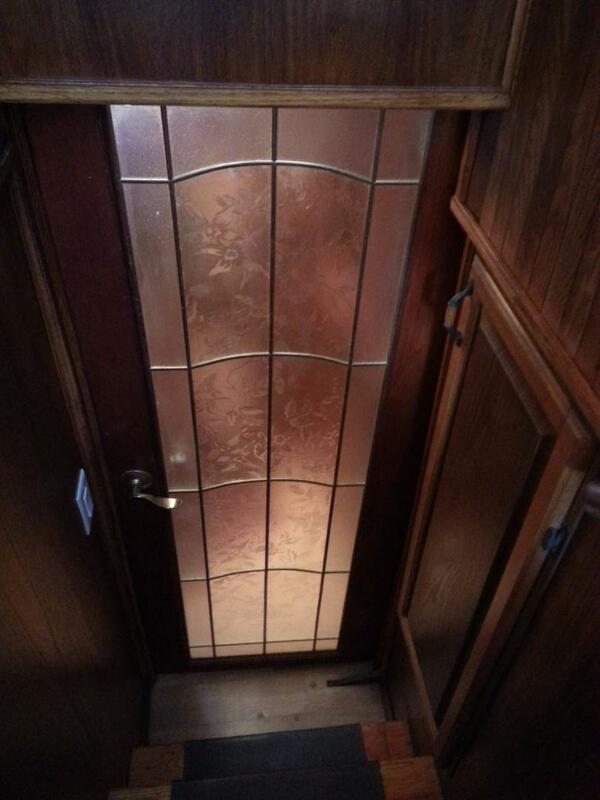 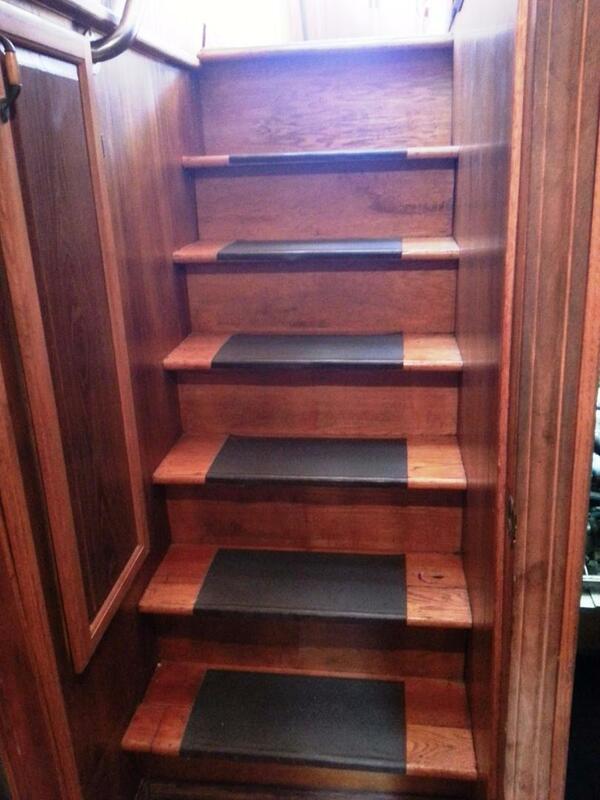 Finally the previous owner will be available for consulting by telephone or on line should it be necessary . 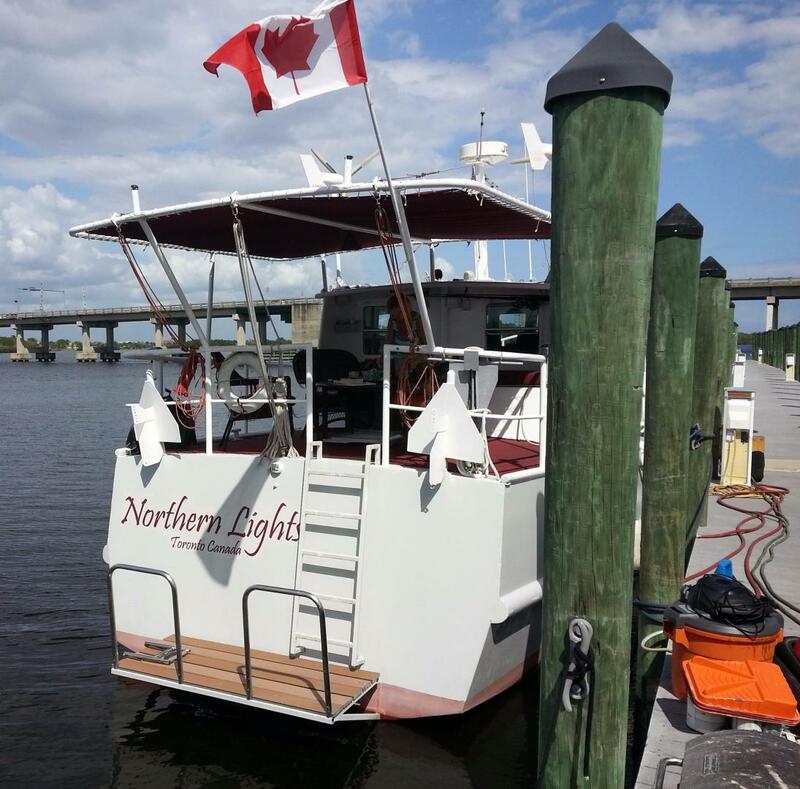 Northern Lights has cruised extensively throughout the Caribbean and Central America - It's a boat that delivers on the dream! 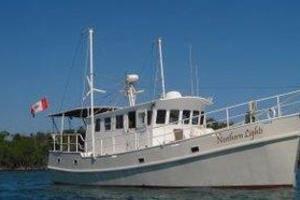 Northern Light is a steel haul, blue water trawler, It based on a George Buerhler Diesel Duck design. 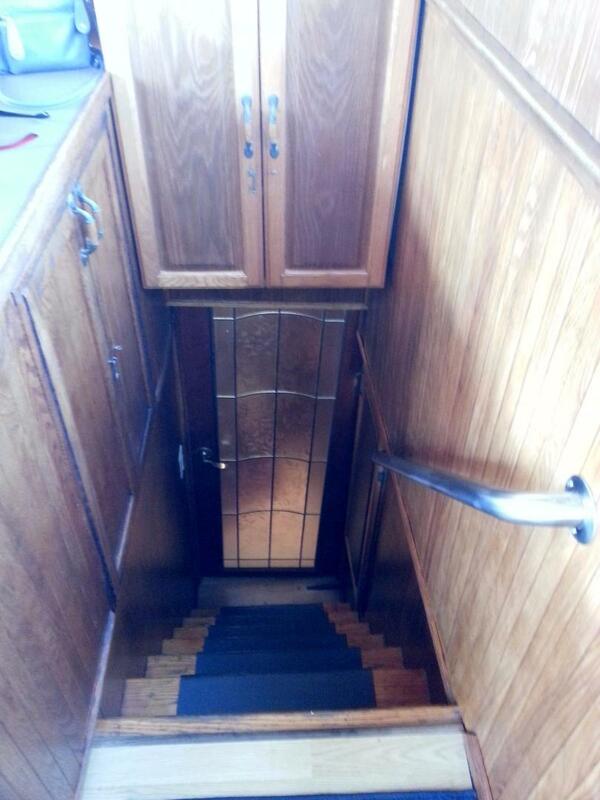 The owner had added his own enhancements and desires to the original blueprints and had the boat manufactured at the McNally Boat Yard, located in Belleville, Ontario, Canada, an exceptional Canadian marine yard, and has built several Cape Horns, Other Diesel Ducks, several Maid of the Mist (Niagara Ontario) and the Segwuin (A large commercial tour boat). 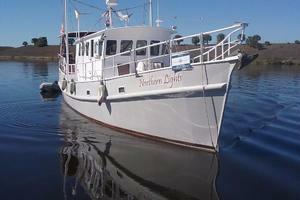 Northern Lights was constructed, to the highest of standards with the finest of materials, in 2000. 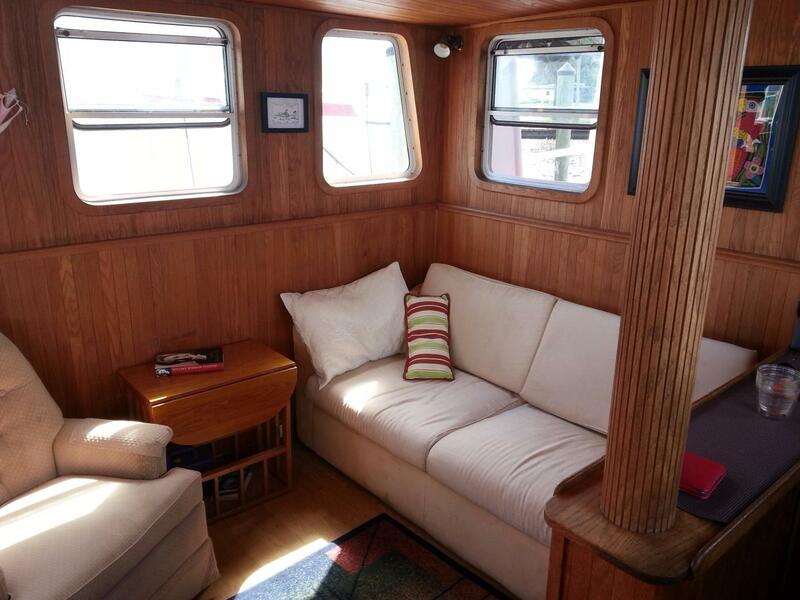 The designs enhancements included extending the length to 50', creating a 12' x 12' covered quarter deck on the top deck; ideal for relaxation and entertaining, creating a spacious pilot house by extending to 16'; providing space for a lounge area, behind the helm, that includes an arm chair and a sofa bed. 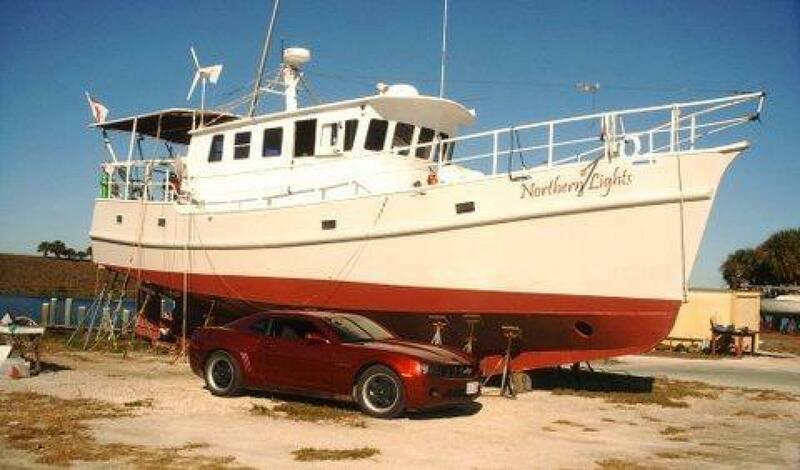 So captain and crew can cruise together. 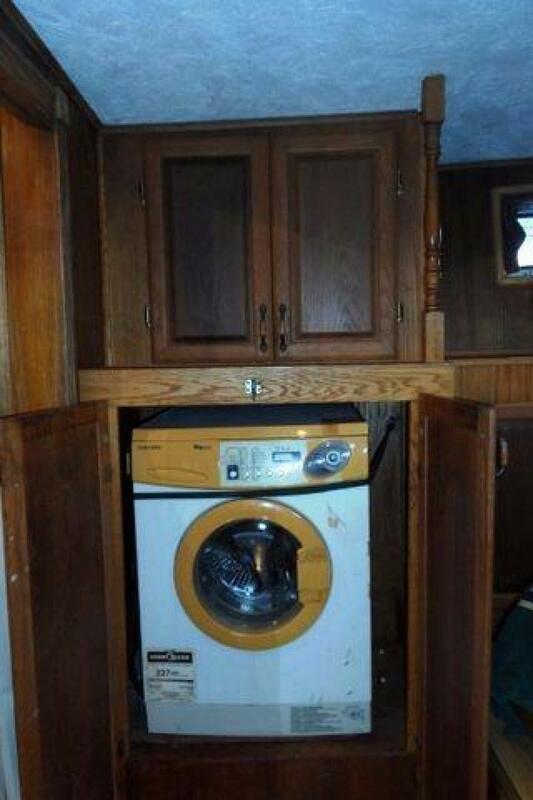 It is well equipped and ready for its next adventure. 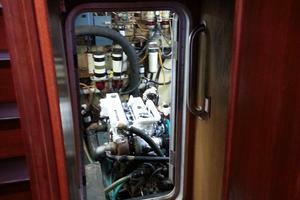 The engine is original and is a John Deere 45 Turbo - 4 Cycle 150 hp. 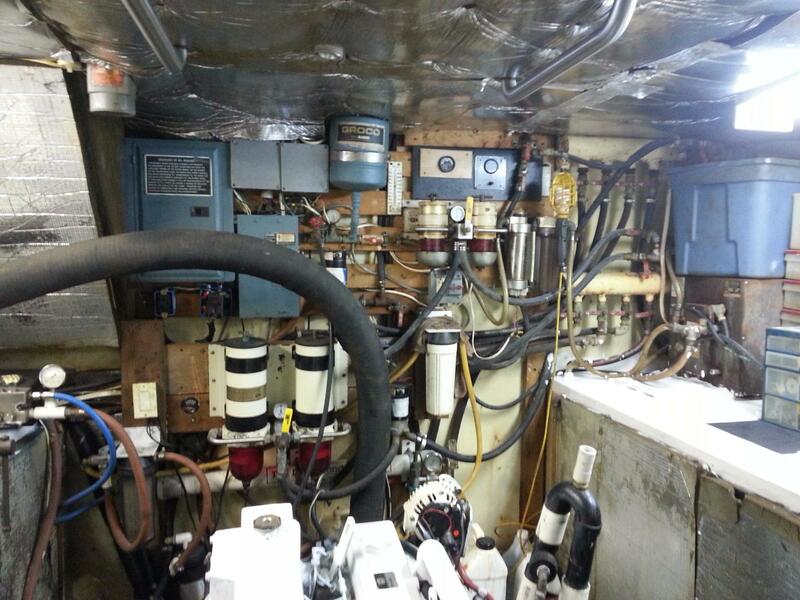 It has approximately 2,000 hours on it.This Diesel Duck has two separate fuel polishing systems. 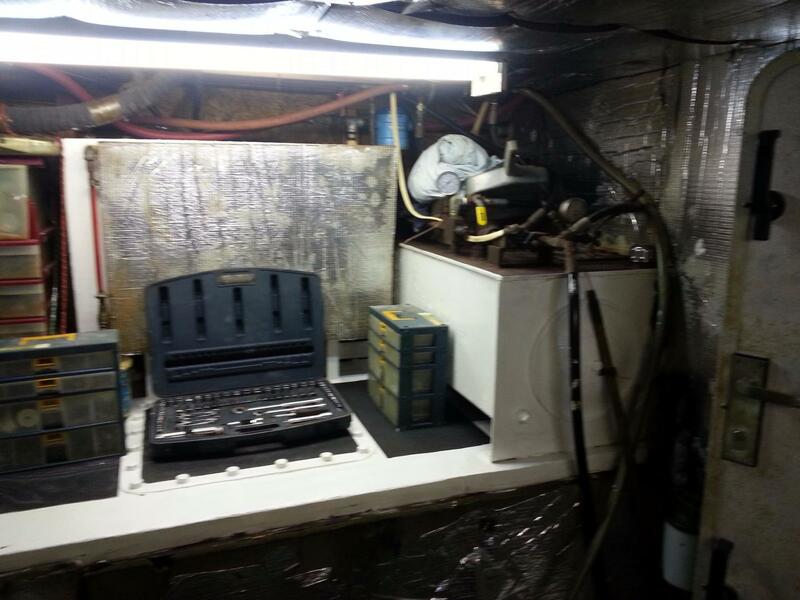 They are Racor systems.The first system was installed in 2000, The second a heavy duty model was later installed in 2007. 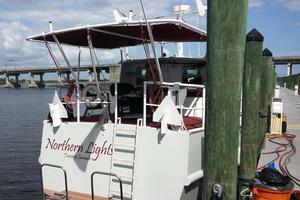 The fuel capacity of Northern Lights is a total of 1,200 gallons. 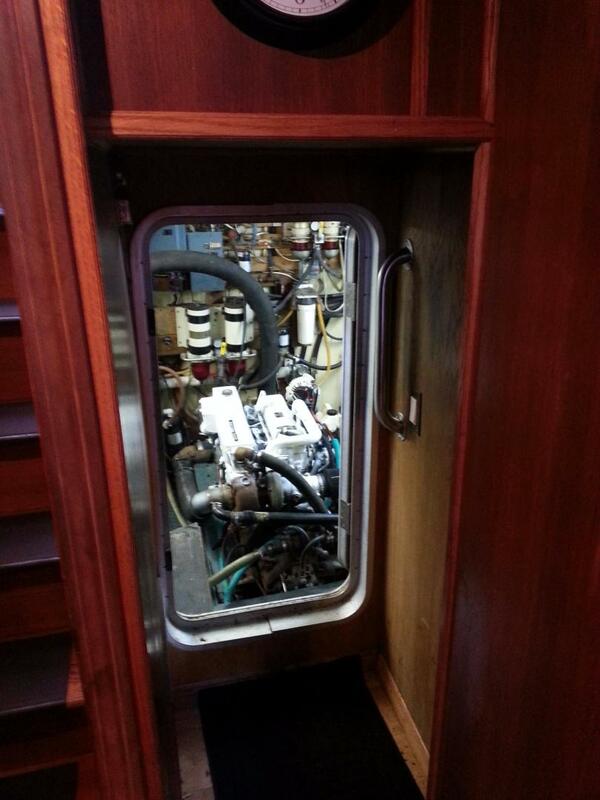 There are four steel tanks that holds the fuel. 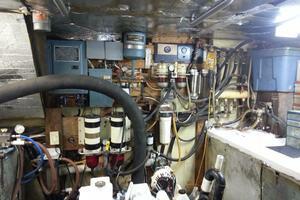 2 of the tanks capacity is 450 gallons each and 2 are 150 gallons each. 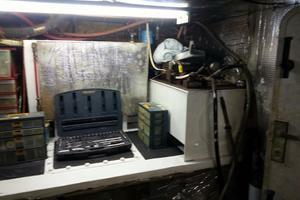 There is also a 25 gallon day tank. 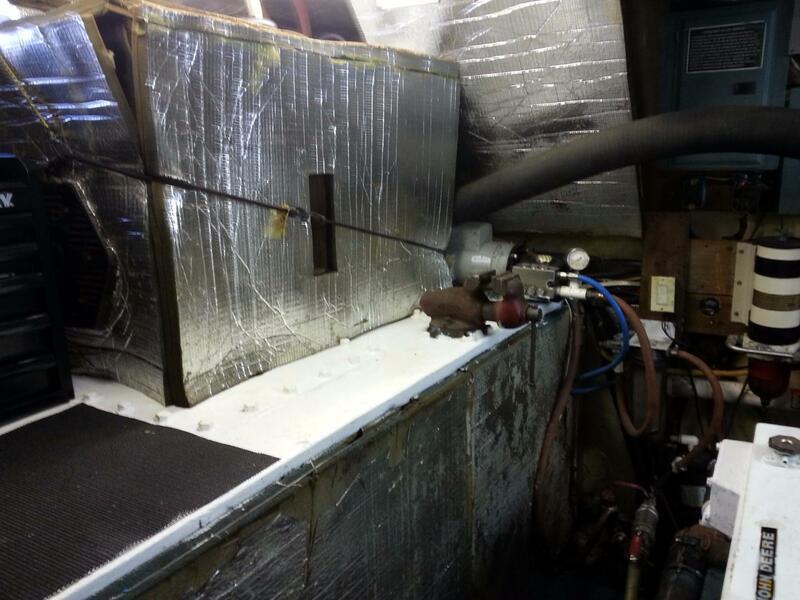 Water is stored in a 100 gallon aluminum tank. 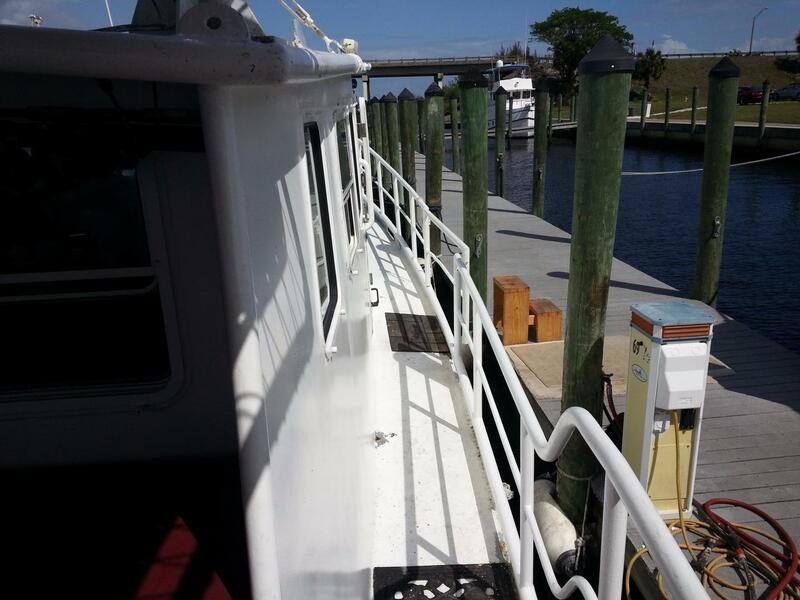 When in port this vessel power connection is a 120 V -30 A cord.The power generator is a diesel Kobota 10kW with 8,000 hrs on it. 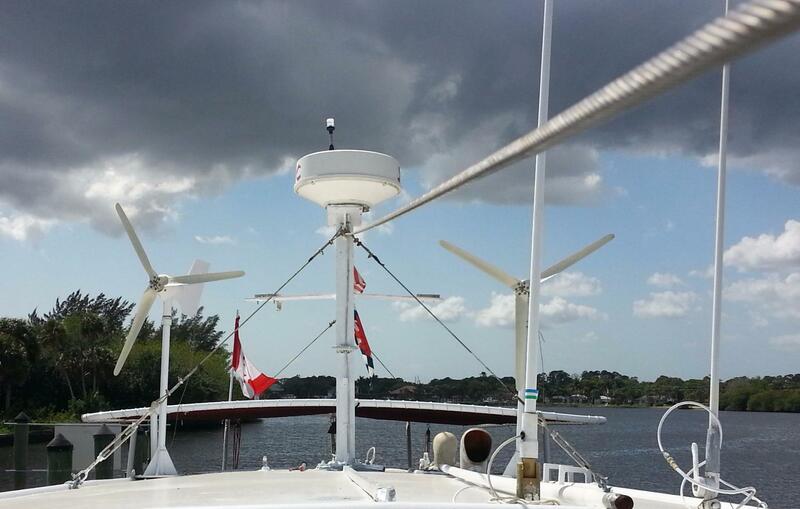 There are two inverters : 3 kW Magnum and 3 kW Freedom 30. 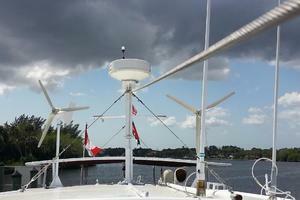 2 - Kiss wind generators were installed in 2012 and there are two small solar panels used to provide a trickle charge to the batteries. 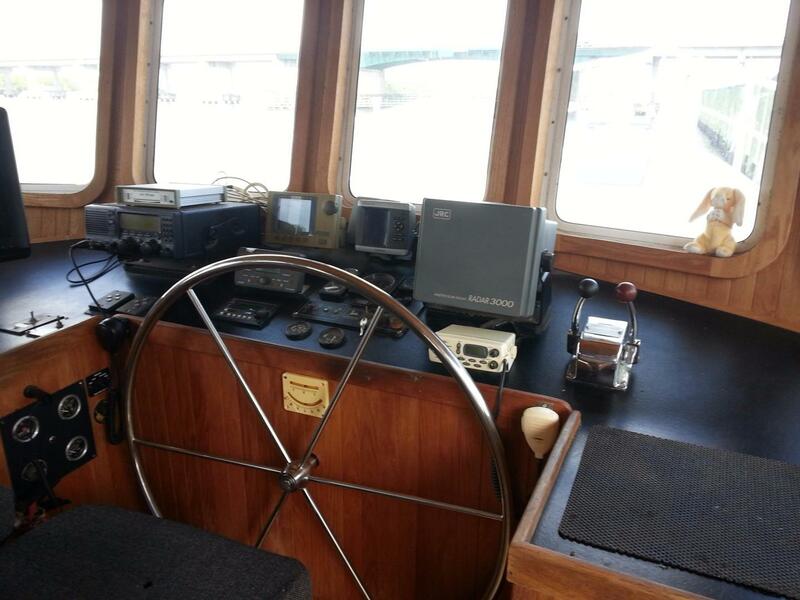 The navigational electronics includes a Maptec Ocean Voyager chart plotter installed in 2005, A COMNAV hydraulic autopilot acquired in 2007, JRC 3000 radar - 24 mile range. 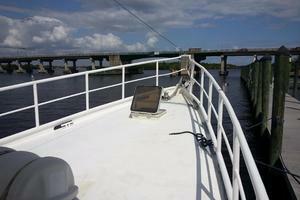 2013 Gramin 450 GPS and depthfinder. 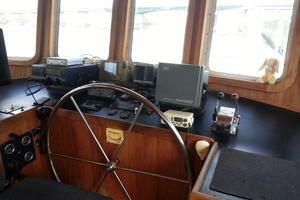 Communication: Single Sideband (SSB), Pactor Modem( emails), Standard VHF radio, Motorola 9509A Sat Phone, ERIB, Entertainment: radio,video player and TV. 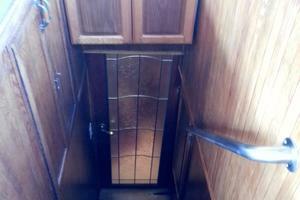 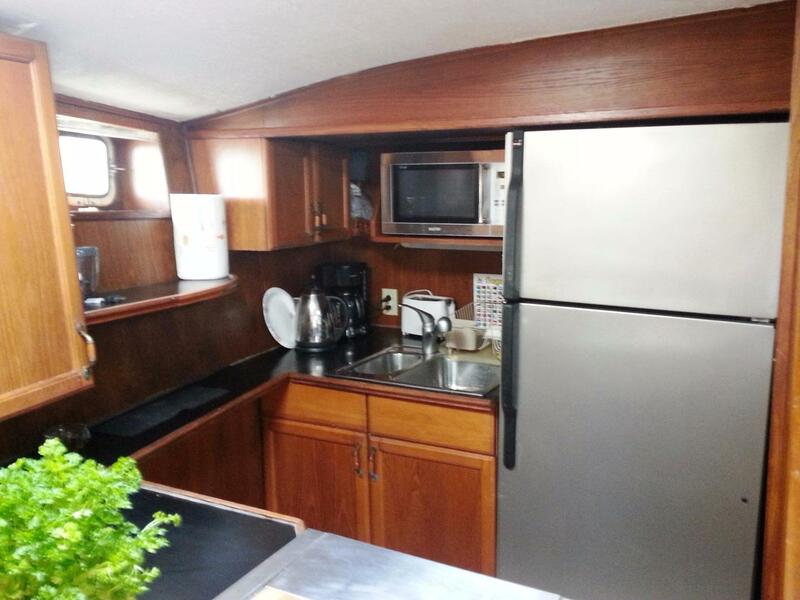 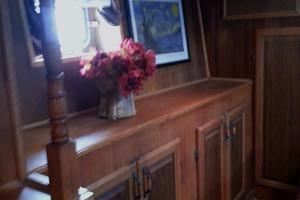 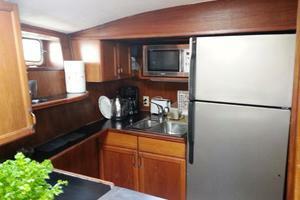 Northern Light has a full galley along with expansive counter space and plenty of storage. 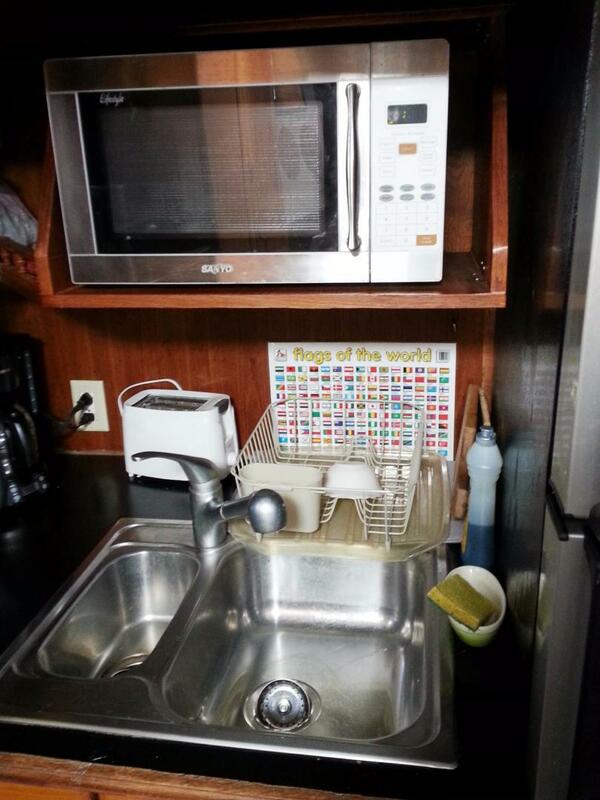 The double deep sink is constructed of stainless steel. 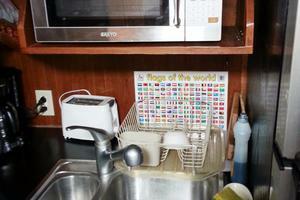 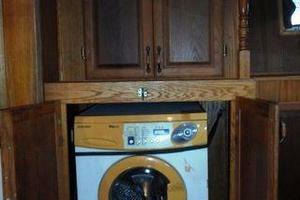 The full refrigerator was upgraded in 2011. 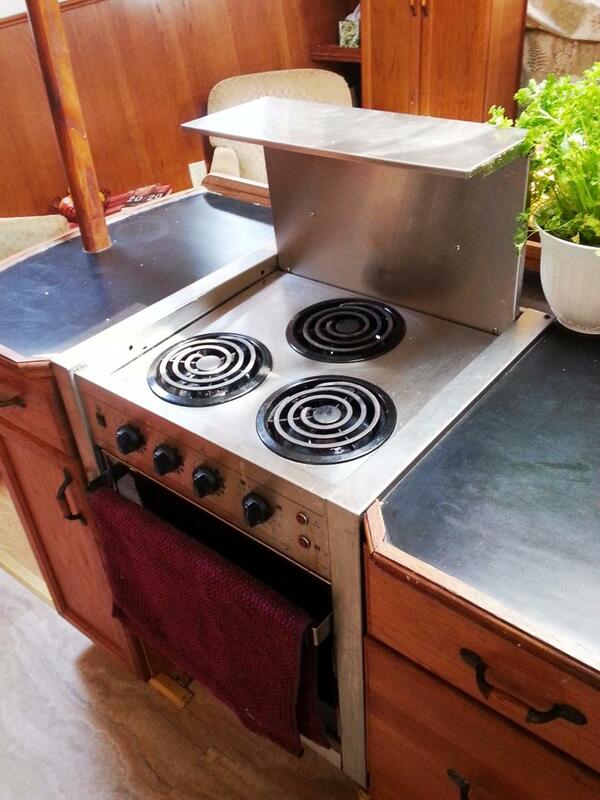 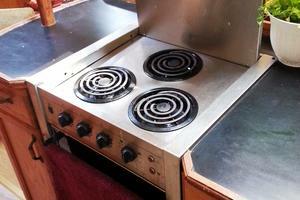 There is a microwave and an electrical three burner/oven combo(220 V). 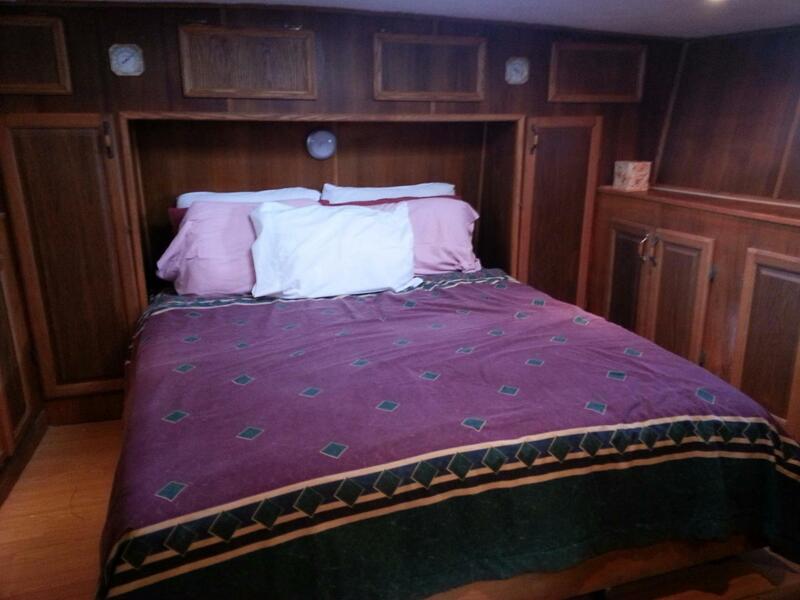 The Aft stateroom has a center line queen size bed. 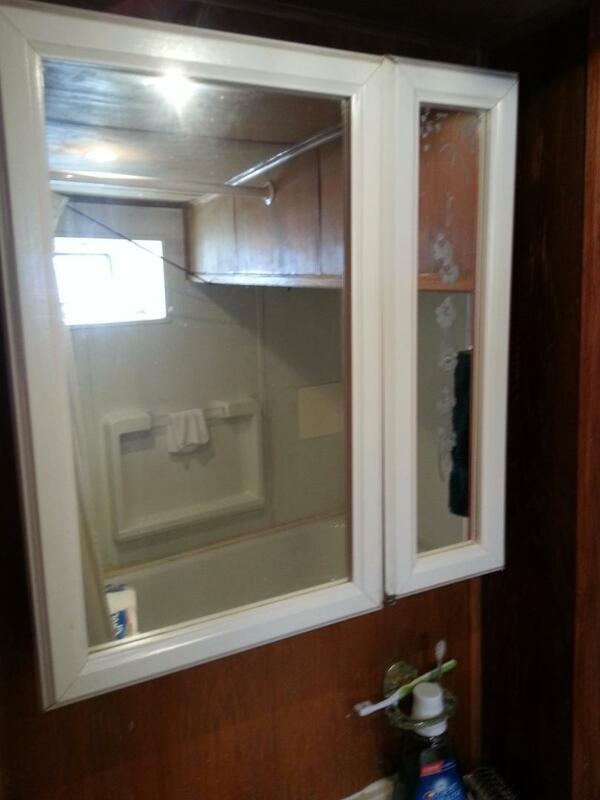 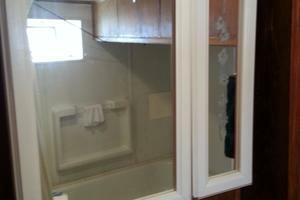 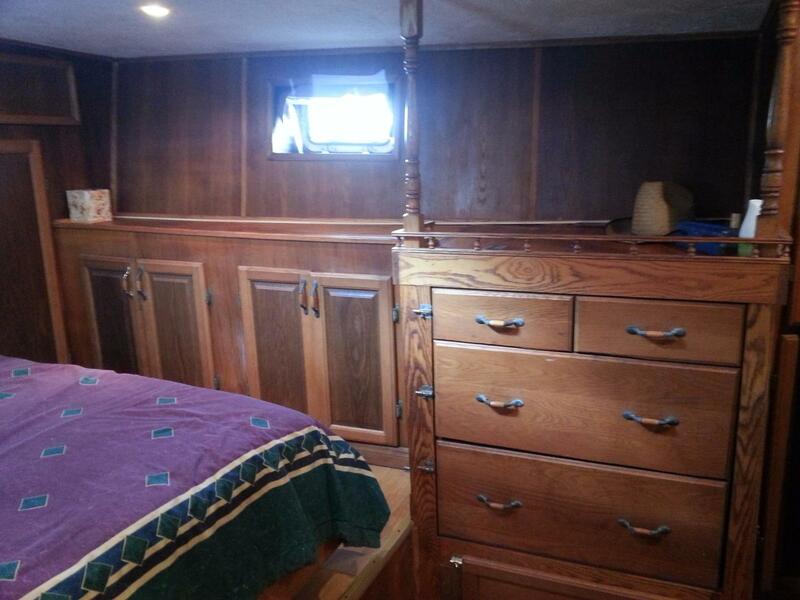 Built in dresser along both sides of the bed with a double hanging closet located near the decorative pane glass cabin door. 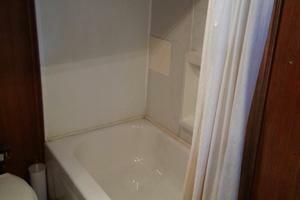 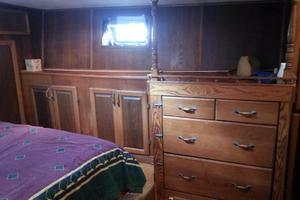 Off the stateroom is a head with a full bath and shower. 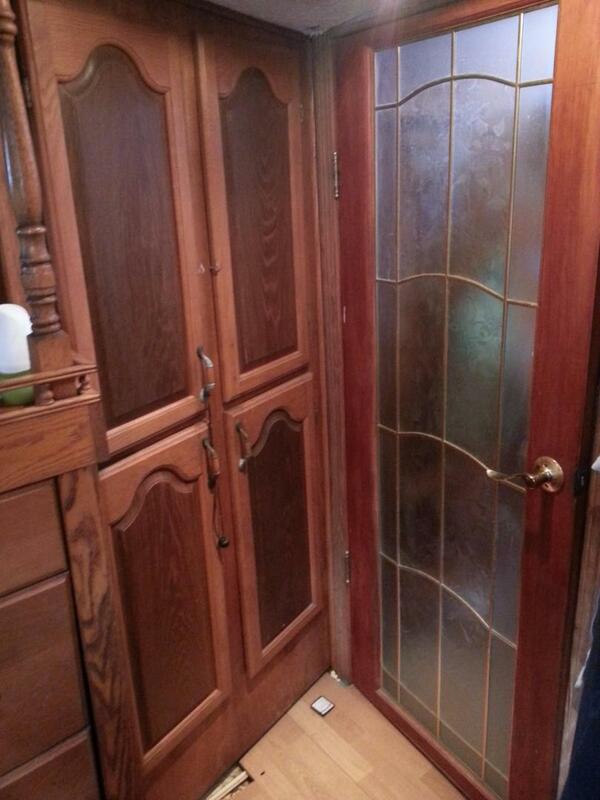 as you proceeds to the forward salon you'll pass a day head right before entering the salon. 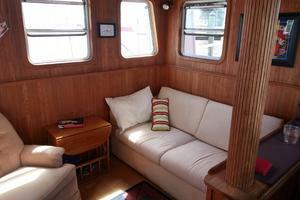 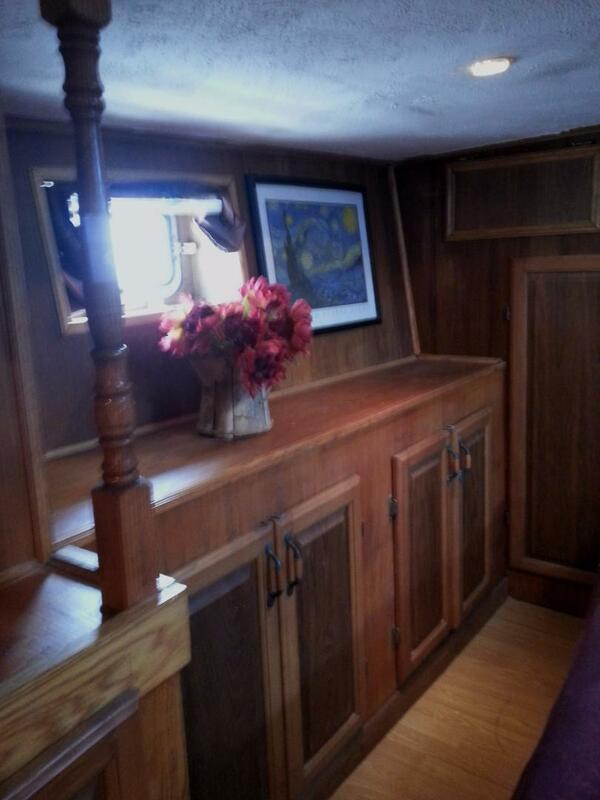 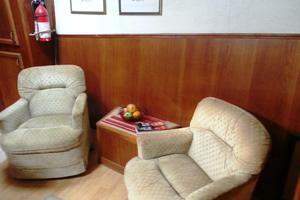 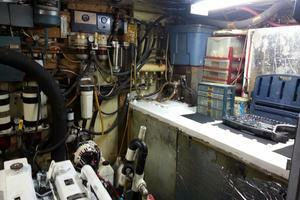 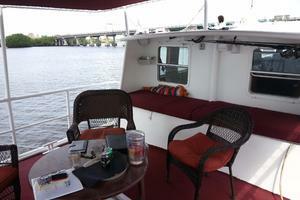 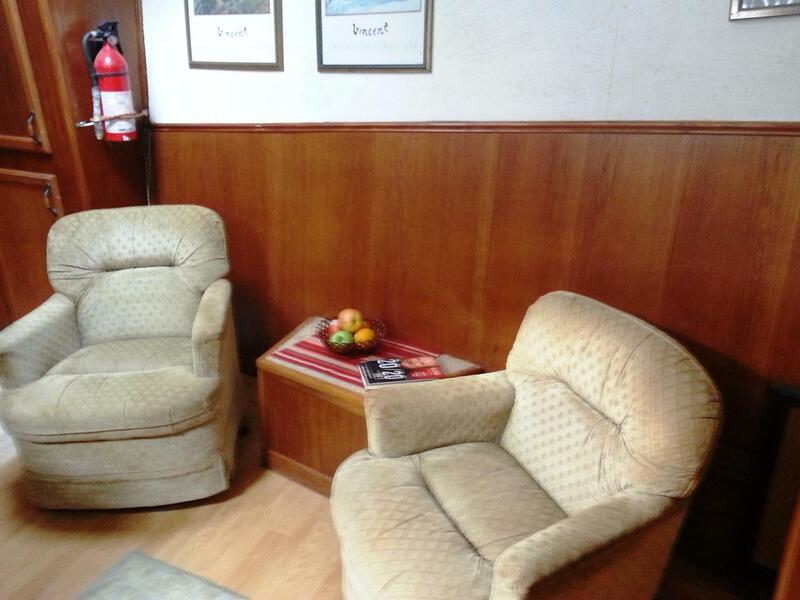 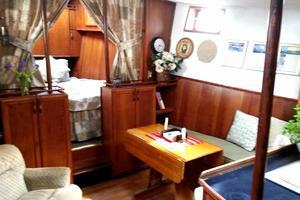 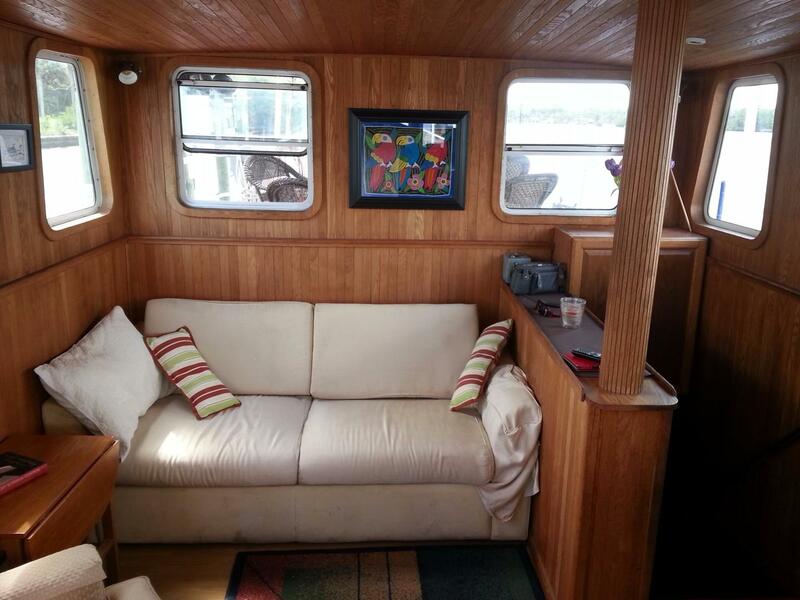 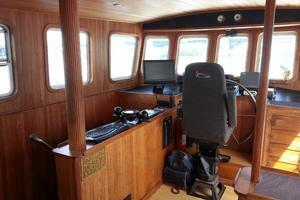 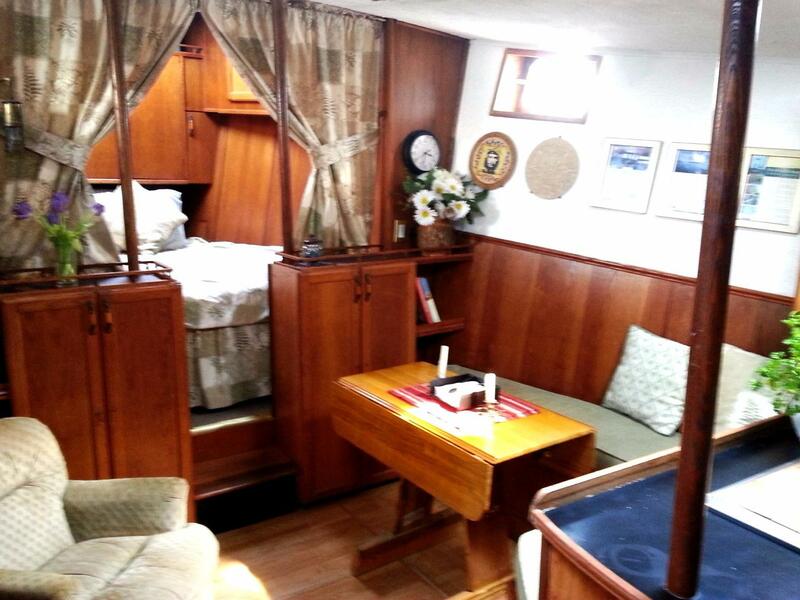 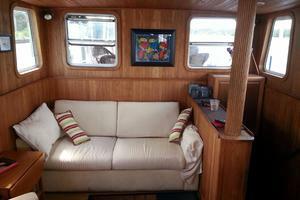 This is a roomy area with a settee and two arm chairs-the galley is located next to the salon. 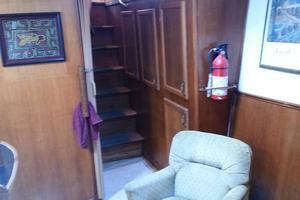 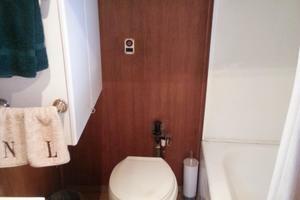 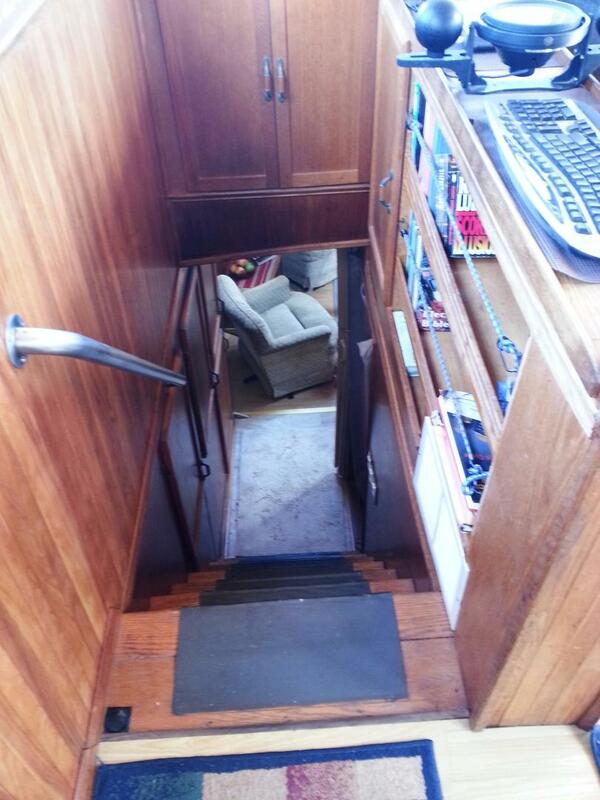 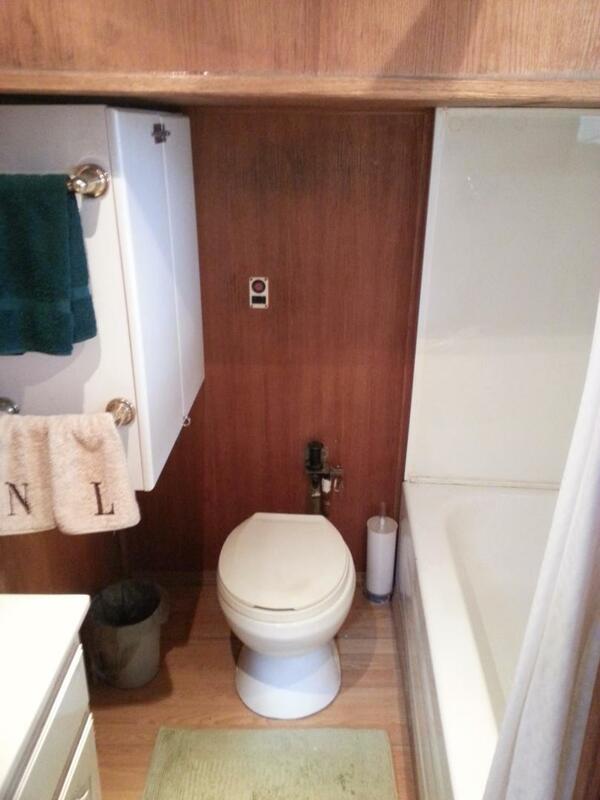 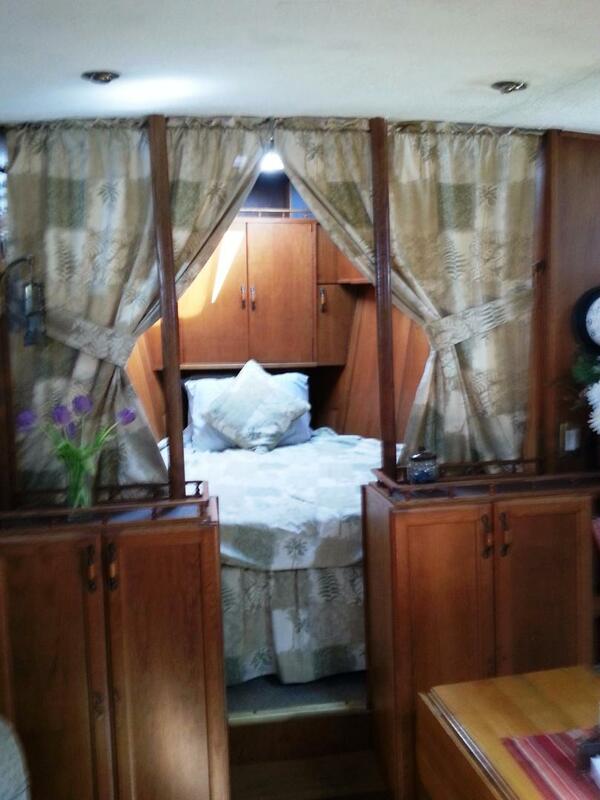 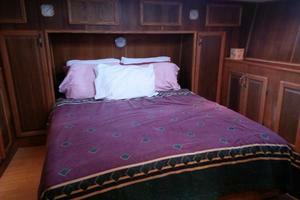 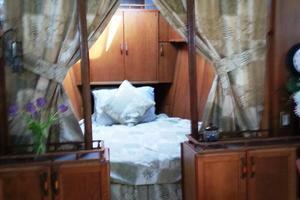 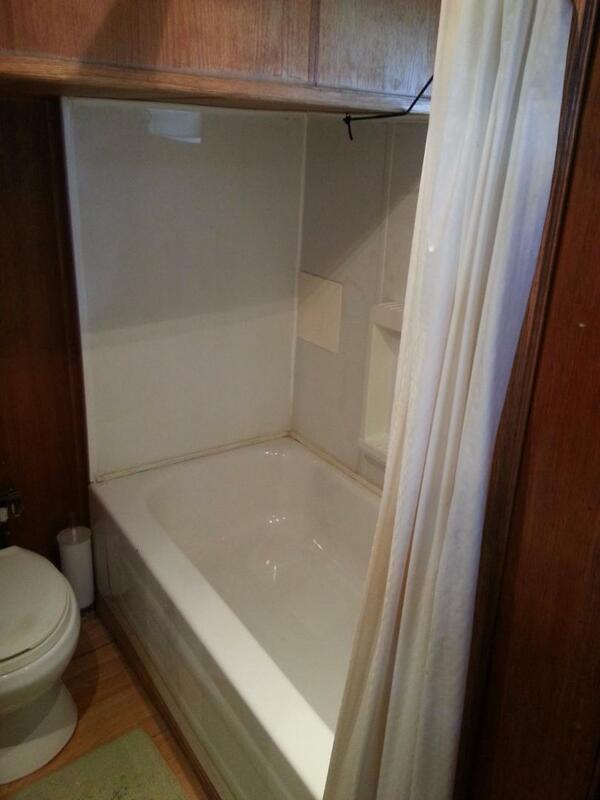 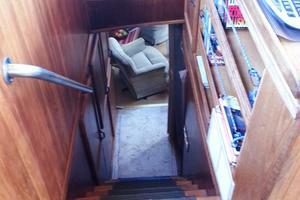 Forward of the salon is a double size V berth with storage. 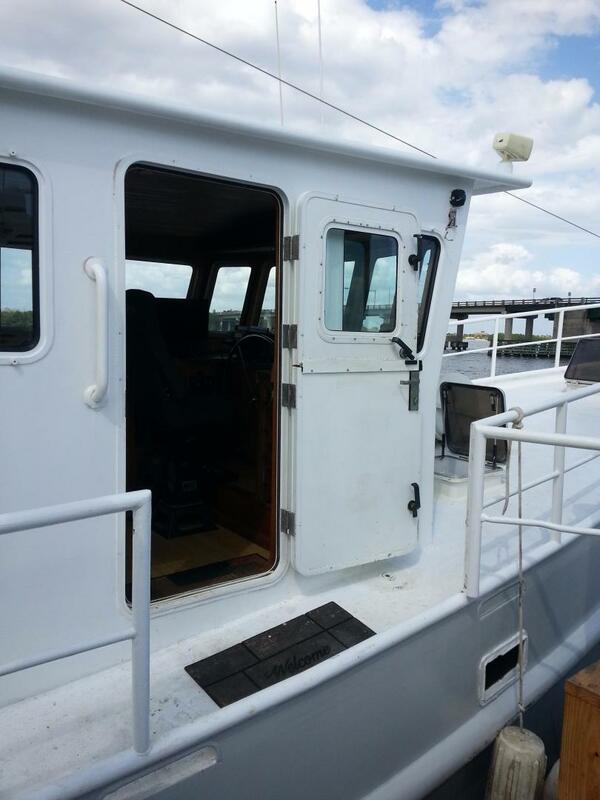 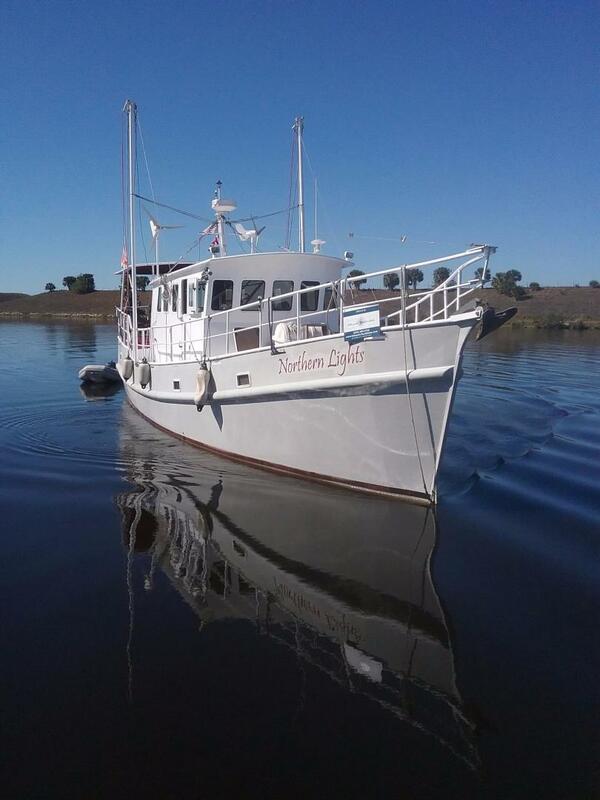 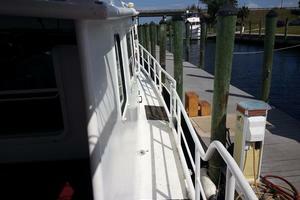 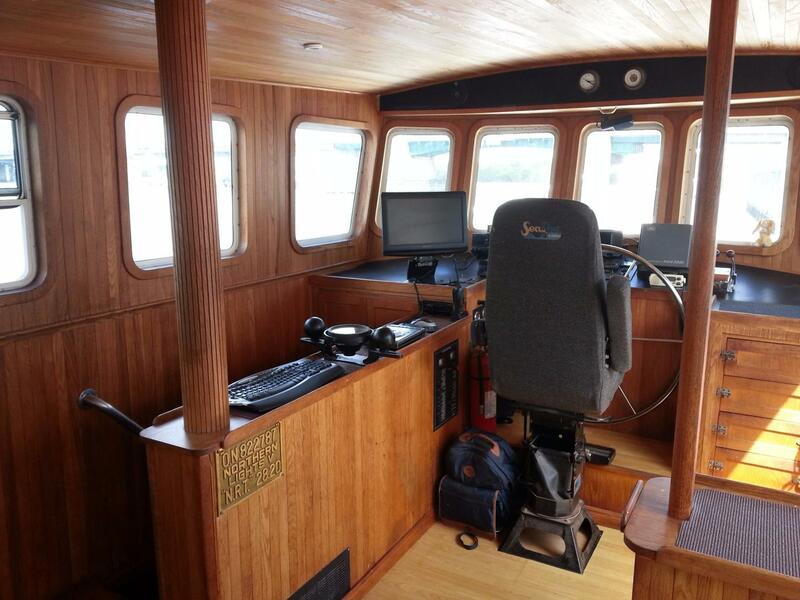 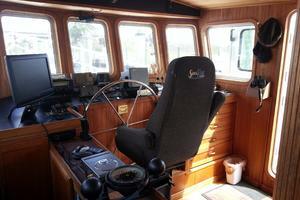 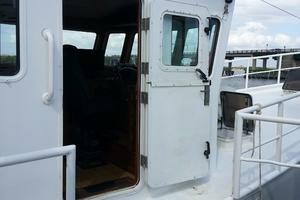 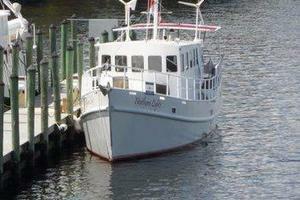 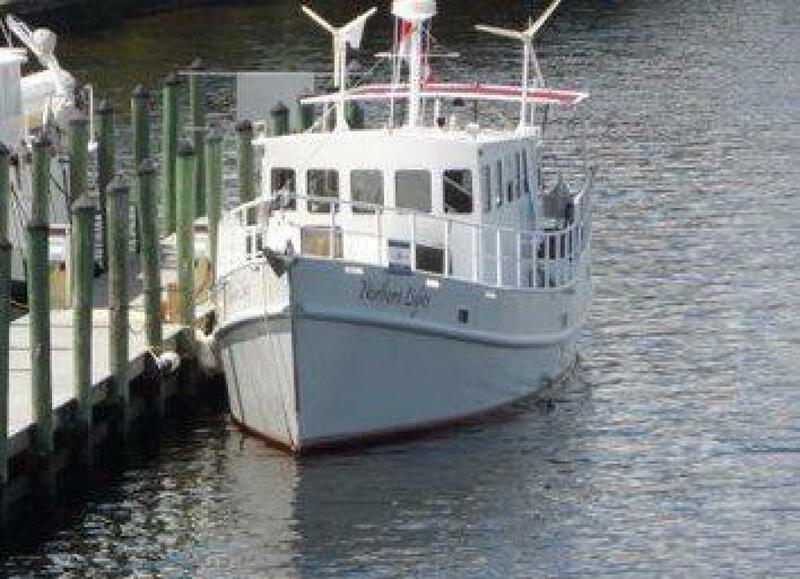 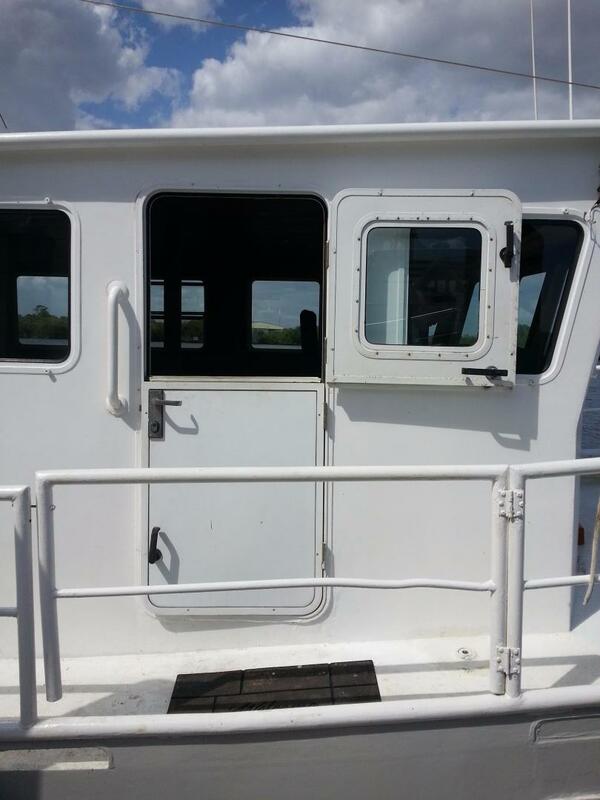 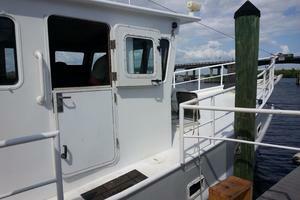 This Duck has a 10" hydraulic bow thruster and Muir windlass with a 2500 lbs lift. 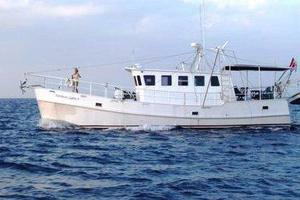 The boat has 1/2 chain with 80 lbs Kingston plow anchor, 100 lb Fisherman backup storm anchor and a 30 lbs. 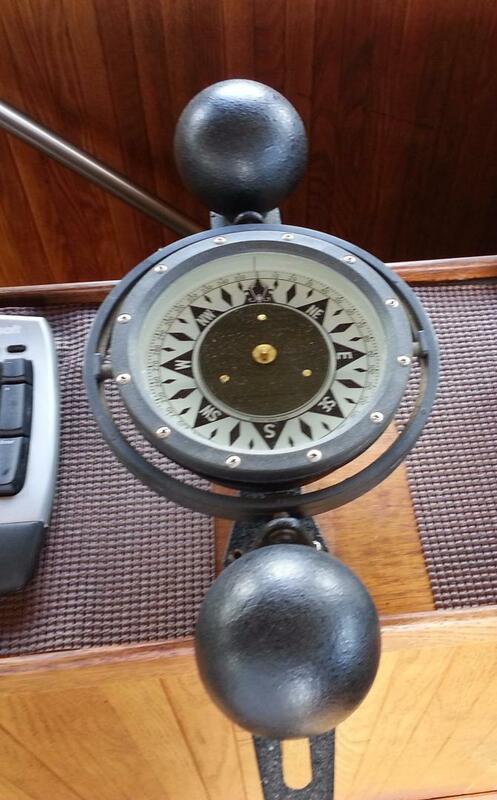 Danforth anchor. 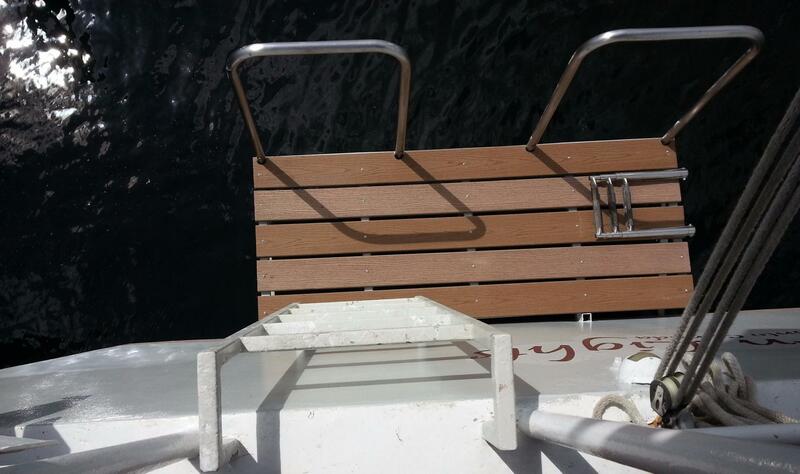 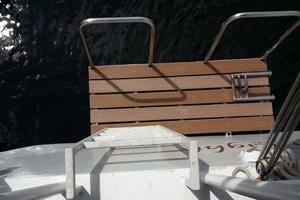 Northern Lights also has a "Para Anchor" for rough at sea anchoring. 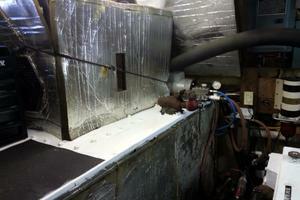 There is a little Wonder water-maker 400 gals./day - 1 hp - 240 V motor. 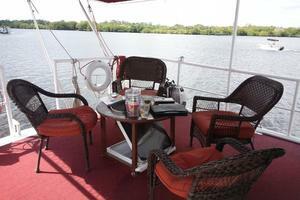 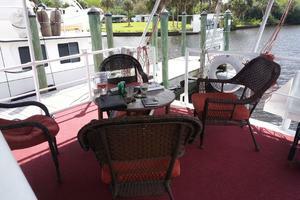 Northern Lights has been very well maintained by the owner, who is the original owner. 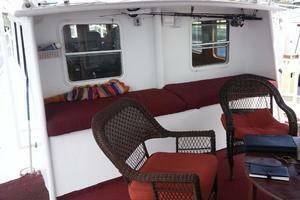 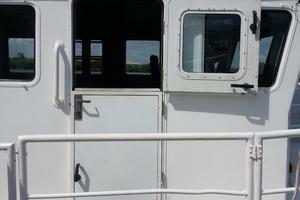 The boat has been consistently upgraded and well cared for. 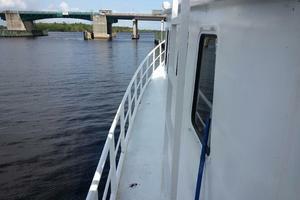 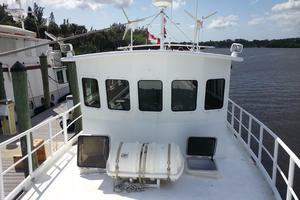 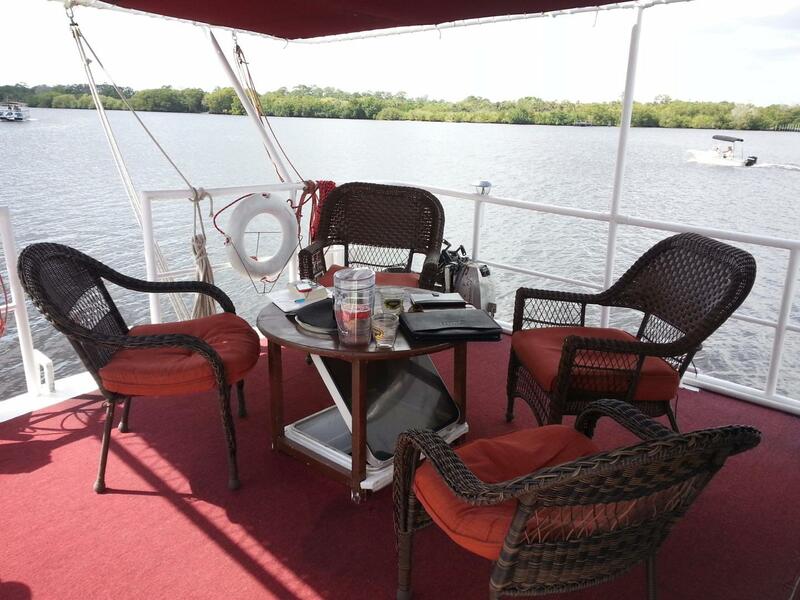 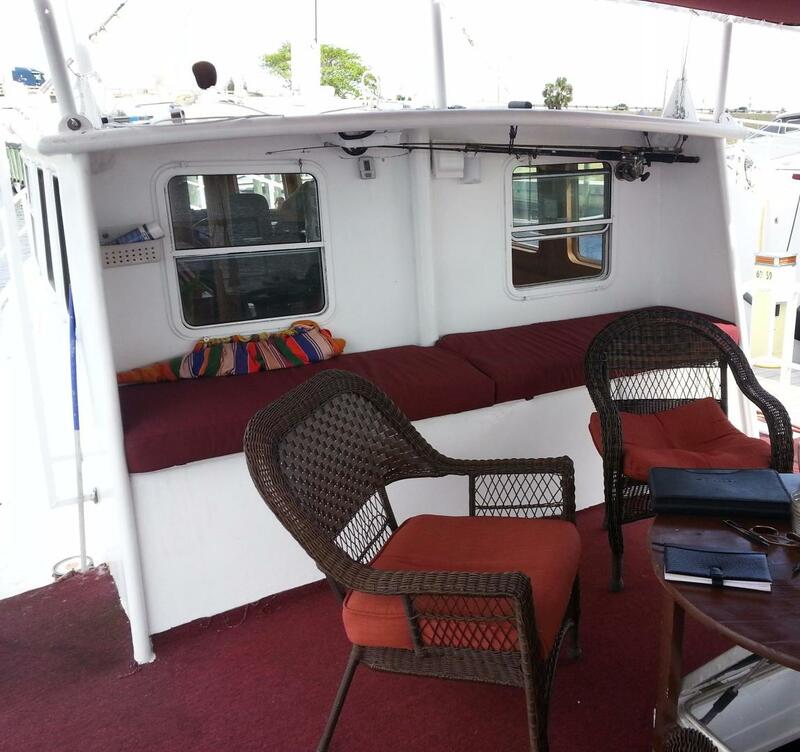 The quarter deck and pilothouse truly makes this vessel a comfortable place to live and cruise. 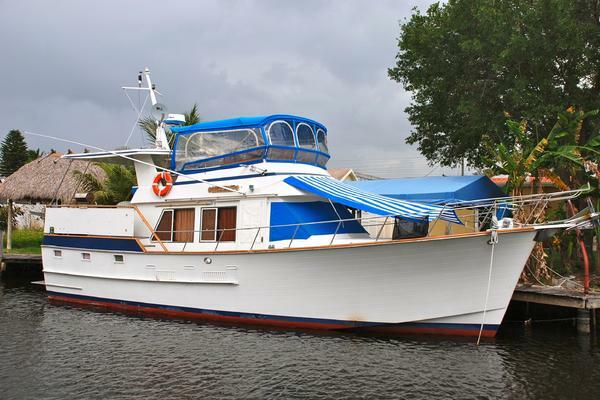 The cruising range and steel hull design makes this boat both safe for any ocean crossing.